Now known as one of the top shopping and dining destinations of London, the cobbled streets of Covent Garden came from humble and much less glamorous beginnings. From as early as 1656, Covent Garden was a jam-packed, bustling fruit and vegetable market. Imagine hundreds of sellers shouting at the top of their lungs, all competing with one another and packed in like sardines – complete chaos! In its infancy, Covent Garden impressively managed to avoid both the Plague in 1665 and the Great Fire of London in 1666, resulting in a huge exodus from central London to the area and the surrounding West End. From then on, the market went from strength to strength, becoming a hub of activity; so much so that in 1670 King Charles II granted a royal charter to officially formalise the area as ‘Covent Garden’. Following the charter, two theatres popped up, putting the cobbled streets on the map as a respectable address, subsequently attracting the aristocracy and upper classes. First came the Theatre Royal on Drury Lane, followed by the Royal Opera House on Bow Street. King Charles II made these the only theatres in the capital that were allowed to perform spoken drama, making Covent Garden the theatrical centre of London, but it wasn’t until 1966 when the fruit and vegetable market was relocated to Nine Elms in Vauxhall that it became more similar to the Covent Garden we now know and love. With the exit of the market sellers, the central piazza was developed and expanded to provide visitors with an eclectic mix of restaurants, cafés and shops. Skip forward a few years to August 2016, when we decided to expand our Aubaine portfolio to include a new Deli, designed to showcase the very best of what our bakery has to offer. We couldn’t resist the draw of Covent Garden’s famous cobbles, and found a perfect spot on the piazza at the corner of Henrietta street. 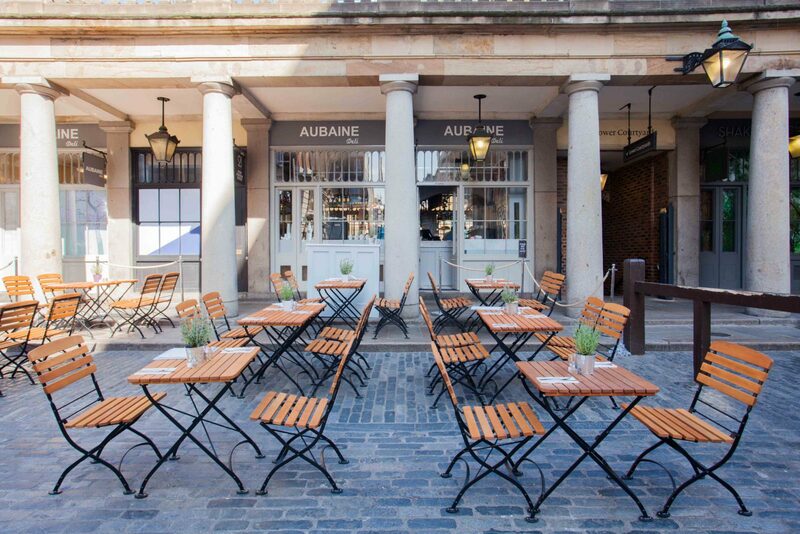 Positioned in the market building, the Aubaine Deli sits right at the heart of Covent Garden’s hustle and bustle, perfect for a quick breakfast, light lunch or pre-theatre cocktail. And with a menu as ever-evolving as Covent Garden’s own history, there’s never a dull moment! So next time you visit this beautiful and historical area of London, make sure to pop in and rest your tired feet (and shopping bags! ).